To say the Eastern Conference Final has been a rollercoaster ride would be an understatement. Neither the Ottawa Senators nor Pittsburgh Penguins have been able to win consecutive games and play has been almost impossible to predict. The best of seven series is knotted at two games apiece, with Game Five set for Sunday. 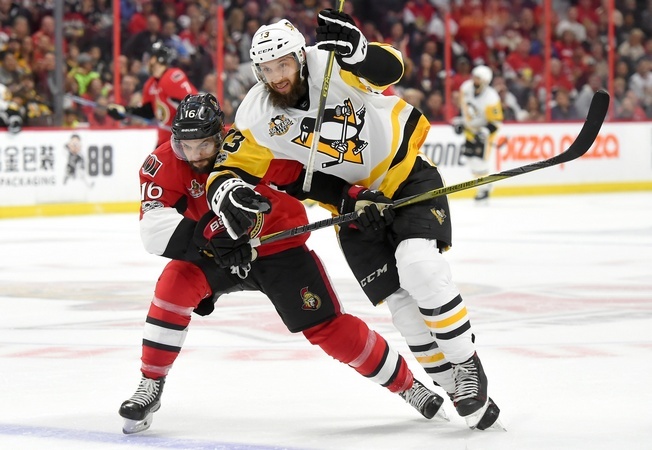 There have been several storylines, from Pittsburgh coach Mike Sullivan’s call to put Matt Murray back in goal for Game Four to the raft of injuries along the blueline to Ottawa’s unproductive power play. Another storyline is the aggressiveness of the Penguins, which caught the Senators off guard in Game Four. Sidney Crosby had two points, including a goal and an assist, and many called it a return to form for the centre. Indeed, it probably was his best effort since sustaining a concussion in Game Three of the second round. “I think you just make sure that you go out there and compete,” he said. Part of that compete level has come with making life difficult for Ottawa goalie Craig Anderson. The plan of attack was transparent in Game Four, as Pittsburgh put the puck on net and forced faceoffs in the offensive zone. From there, the Penguins won seven of 10 offensive zone faceoffs in the first period alone and went to work. Making sure you compete is part of anyone’s game plan, but the Senators will need to turn that hockey trope into something tangible if they want to counter Pittsburgh’s attack. So far, their 1-3-1 forecheck has been paying dividends and shutting down the Penguins. It’s true that Crosby and Co. have had success countering the stingy defence with a dump-and-chase method, but Ottawa makes playing in the defensive zone difficult. Winning will take more than stifling the opposition and that’s where the Senators could use a boost. They went without a goal on the power play in four chances in Game Four and their 5-1 explosion in Game Three is kind of an anomaly, so adjustments may be in the works to put more offence in the mix. Those adjustments will be subtle, which confirms the slingshot nature of the series. Plainly put, the Penguins won Game Four because they played like the Senators. They took possession of the puck. They blocked shots. They collapsed in the defensive zone and forced difficult chances. And when Ottawa was desperate, they pounced. In Game Five, expect Pittsburgh to stick with what works. They’ll try to out-Ottawa the Senators. In the end, that could make the difference. If Ottawa is beaten by their own game, they could miss their chance at the Stanley Cup. And the Penguins will have proven once more that they can and will make the right adjustments along the way.